Life is a tapestry. Woven into it are faces and places, beliefs and experiences that form the design. I believe the designer and maker is Jesus Christ. I trust Him to turn the broken and misaligned threads into a perfect work that functions for His purpose. By nature, I prefer to be the background with space and time to be creative. 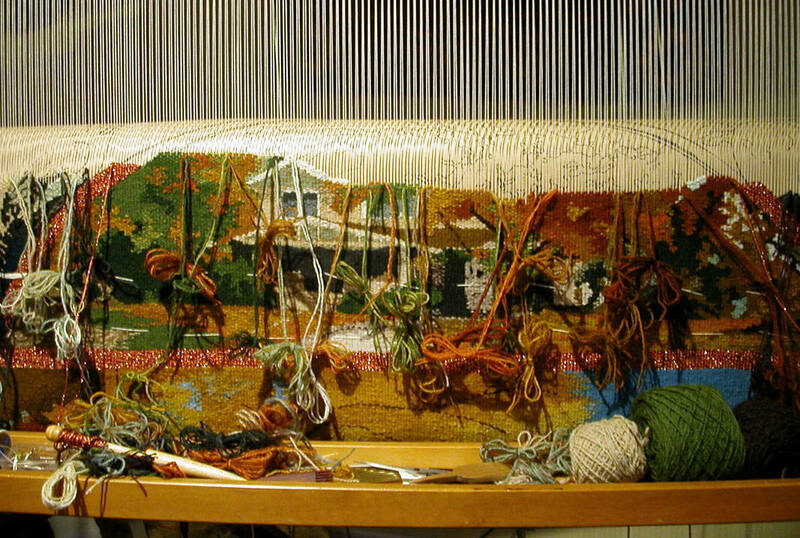 I love working with fabric, such as upholstery tapestry, and furniture restoration. My home is (over) filled with my furniture creations which means many pieces are sold or go to the homes of others. As a nurse I’ve practiced my nursing and leadership skills in a variety of settings: Long term care, Home Care, Public Health, Hospital care, including most recently, a decade of Infection Prevention and Control. Promoting health is a passion. Often however, healthcare is more about ill care, rather than promoting a healthy lifestyle as I too experienced. My own health took a nose-dive. A purse full of pills of all sorts could not alleviate the physical and emotional dis-ease I experienced. For years, the discomfort persisted despite the advice of many doctors, counselors, special diets and various alternative health practices. At the right time, God directed me to a spiritually grounded psychiatrist with a background in general medicine. 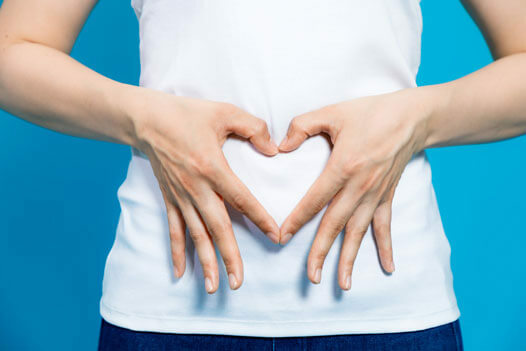 Her holistic approach opened the door to better control of my total health. My recovery however, hit a plateau and I couldn’t quite attain the health freedom I sought. Then one day a friend introduced me to essential oils. A bit cautious, I tested the water, so to speak, and tried Frankincense. And then another oil and another oil …..because they made me feel better than I had in decades!!! One by one, the symptoms that crippled me resolved. What are these essential oils? 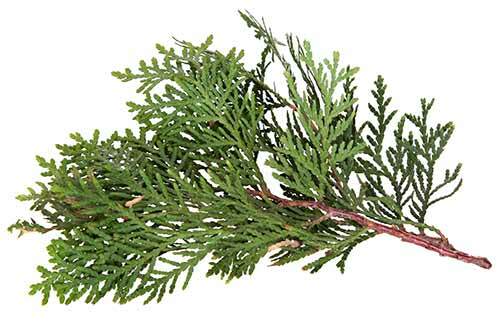 Extracted from plants essential oils work naturally without toxins or frustrating, harmful side effects. Essential oils are God’s goodness. He designed us for health and surrounded us with a garden of plants. 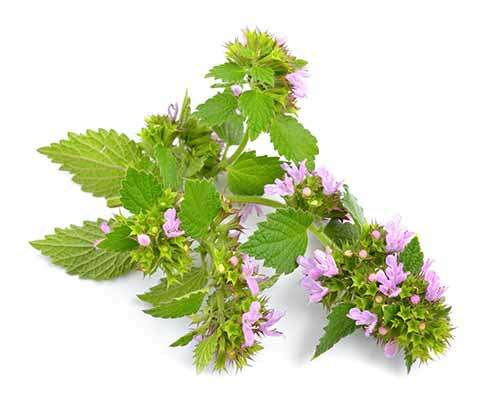 From ancient times…long before ‘modern medicine’… essential oils and herbs were valued for their healing properties. New technologies allow companies extract essential oils from plants in quantities and at prices affordable to many more people. No longer is the knowledge of healing plants the secrets of a few practitioners, but is now available to all of us. In this blog you’ll read about my passions including the wonder I find each day using essential oils. Social media creates a thread that brings our lives together in an emerging tapestry. I hope you will join me in experiencing the power of essential oils. God bless. Welcome to our second Live Your Passion Rally of 2019—our actual 25-year anniversary week! As we continue Gary’s vision of providing every home in the world with pure essential oils, it’s important to remember why he and Mary planted the Young Living seed over two decades ago. Young Living has put together one of the most exciting promotions we’ve seen recently. It’s called Dream 1000, and it runs from April through July in the US and Canada. It’s based on earning points for focusing on the core personal business behaviors: things like purchasing a Premium Starter Kit, enrolling in Essential Rewards for the first time, or your personal enrollee ranking up. These are many of the same things we’ve been focused on for Help 5, which should help your team hit the ground running for Dream 1000. Part of our commitment to Gary’s vision is to open five new markets each year over the next five years. Macau is currently YL’s largest NFR market, and at the end of April, it will become our second fully open market of 2019. Macau is consistently a top-growth market; its proximity to Hong Kong and mainland China has greatly accelerated its development. 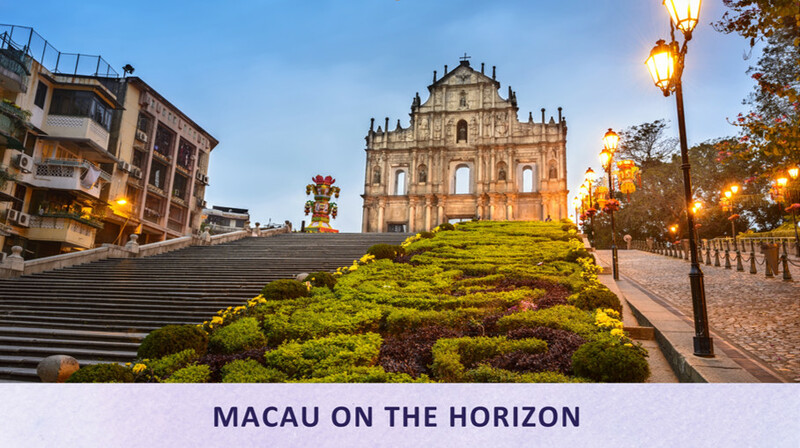 We’re excited to reward the hard work of our dedicated members in Macau with all the benefits of being a Young Living open market! This year The D. Gary Young, Young Living Foundation is celebrating 10 years of providing wellness and education opportunities to underserved individuals and communities around the world. The Foundation started empowering lives when the passion, vision, and heart of Young Living Founder D. Gary Young led him to build the Young Living Academy. Stay tuned for a special announcement! The Young Living Foundation is thrilled to announce a university scholarship endowment fund called “D. Gary Young Leadership Endowment”. Gary Young had a passion for education; he believed in learning about the world and how it works. Unfortunately, some of our Young Living Academy graduates are struggling to continue their education. Due to their socioeconomic status, many are forced to give up their studies and work to help their families meet day-to-day needs. 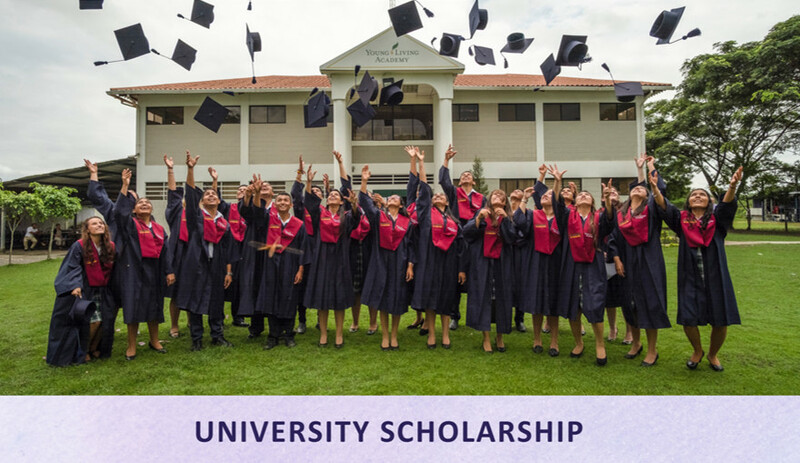 This endowment will support Young Living Academy graduates who want to pursue their dreams of attending university. We invite you to join us in securing the endowment’s first million dollars to support these graduates. Learn more about this new program by visiting YoungLivingFoundation.org/YLAuniversityfund. These images are heartbreaking and happening more frequently than ever. Plastic, though it has transformed our quality of life, is having a powerfully negative impact on our world. 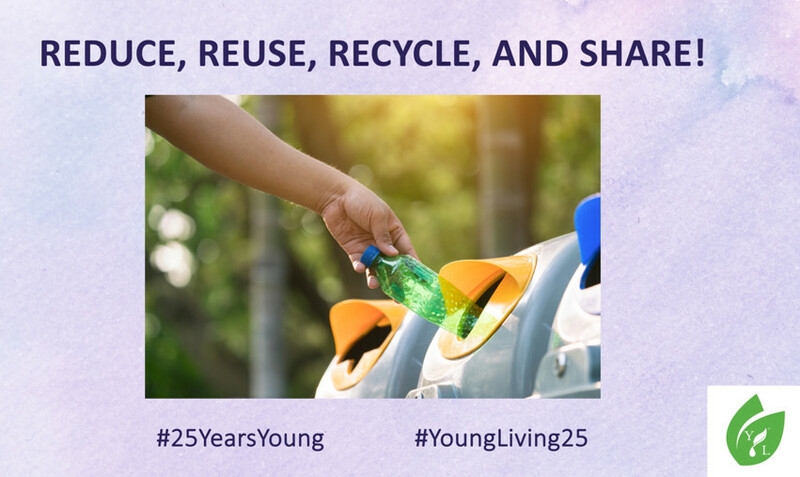 Young Living recognizes the need to rethink our use of plastic. I’m so proud to be part of an organization striving to reduce its waste and encouraging others to do the same. Achieving zero waste is no small feat. 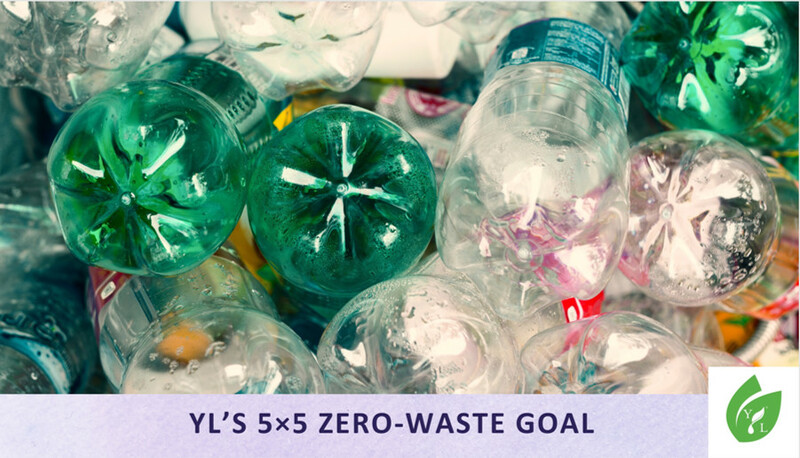 Earth-friendly changes are well underway at YL, and we’re excited to share what we’ve been working on! We’re currently working to reduce waste in our farming, distillation, manufacturing, and shipping operations, as well as in our employee facilities by practicing the five Rs of zero waste: refuse, reduce, reuse, recycle, and rot. We’re looking at all material inputs and waste outputs to identify and implement improvements that will not only reduce our waste but also keep more waste from landfills. 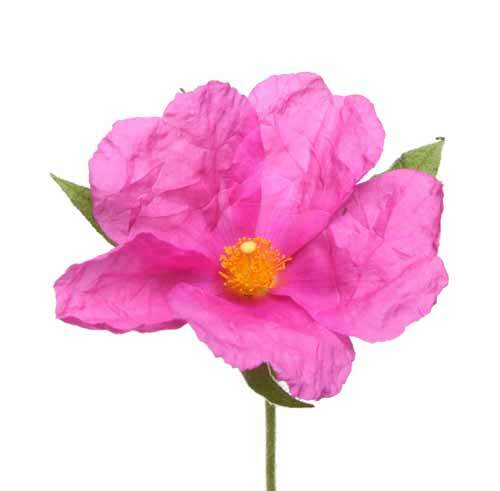 Use completely recyclable boxes and packaging material; ship items in optimal box sizes. Use less packaging and more post-consumer recycled and recyclable materials. Reduce our use of paper by providing employees and members with more digital options for sharing YL content and collaborating with their teams. Start a robust recycling and composting program at our employee facilities and farms to help reduce our waste by over 60 percent this year! Implement a water-recycling system at our distilleries, along with additional water conservation efforts at our farms. Educate members and employees about how to further reduce our waste and send monthly emails with zero-waste tips and ideas. Are you reducing, reusing, and recycling? Show us your zero-waste efforts on Instagram using one of these hashtags for the opportunity to be featured in next month’s blog post sharing the top 25 ways to accomplish the three Rs. If your profile is private, make it public so you can participate in our 25 Years Young sustainability initiative. We all can do our part in showing our communities simple ways we can save the planet! 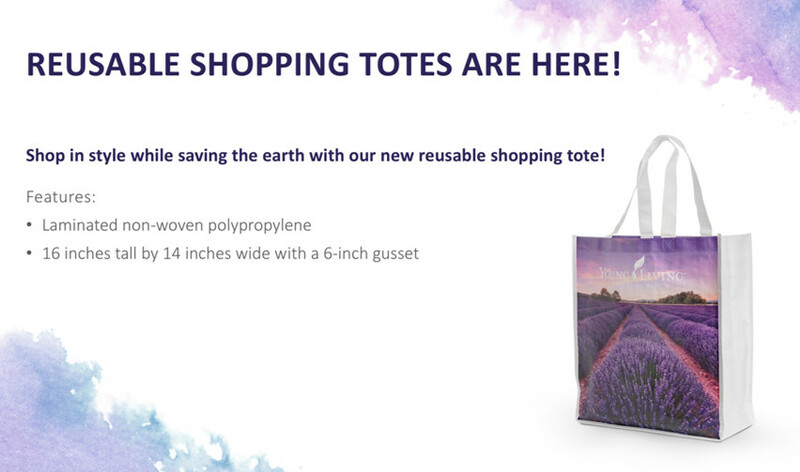 Speaking of doing our part, check out this gorgeous reusable shopping tote available on YoungLivingGear.com. Whether you’re headed to the grocery store, packing a picnic lunch, or hitting the gym, this tote’s got you covered! Purchase a tote by midnight, MT, on April 8 and receive a 10 percent discount. There is no PV associated with this one-time offering, which is available only while supplies last. Head to YoungLivingGear.com today! 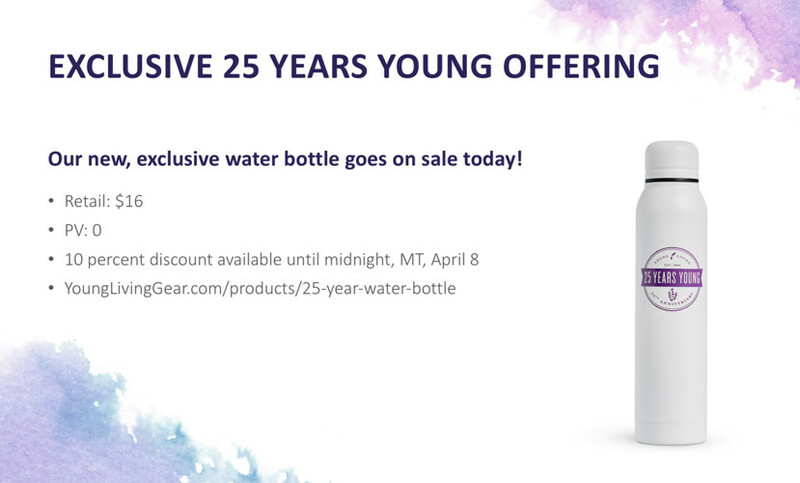 We’ve created an exclusive water bottle featuring our 25 Years Young logo as a keepsake for this memorable year and an easy way to ditch plastic water bottles. Use the link on the slide to purchase yours from the YL Gear store. If you purchase a water bottle before midnight, MT, on April 8, you’ll receive a 10 percent discount. 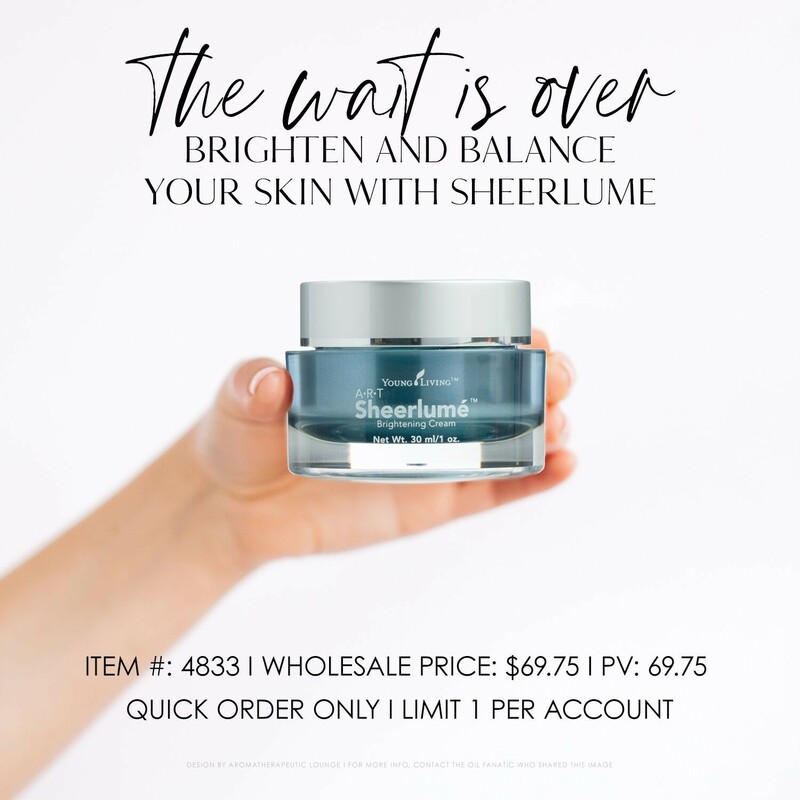 There is no PV associated with this one-time offering, which is available only while supplies last. Get yours today! 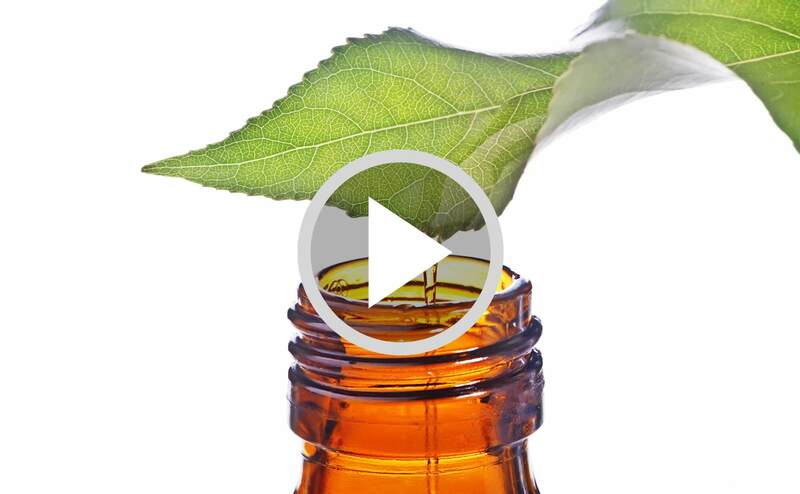 Check out this video introducing Australian Ericifolia Essential oil! Australian Ericifolia (Melaleuca ericifolia) is native to Tasmania and has a pleasantly woodsy scent with sweet floral, herbaceous back notes. This oil combines the crisp scent of Tea Tree with the calming and soothing aroma of Lavender. 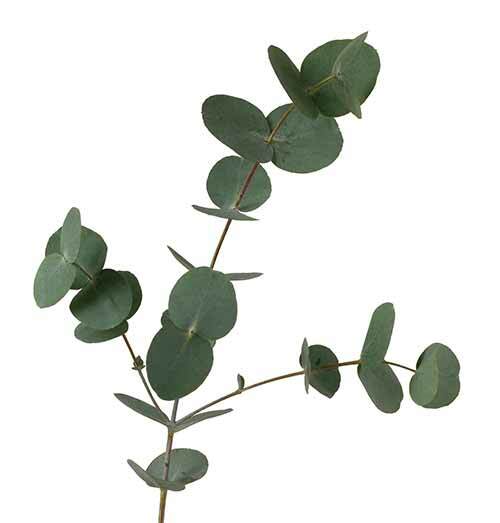 Like its Tea Tree cousin, Australian Ericifolia carries a mild eucalyptus-like aroma, but its linalool content gives it a touch of sweet lavender with a hint of citrus. Australian Ericifolia is harvested from wildcrafted populations grown on Flinders Island, part of the Tasmanian archipelago of islands. 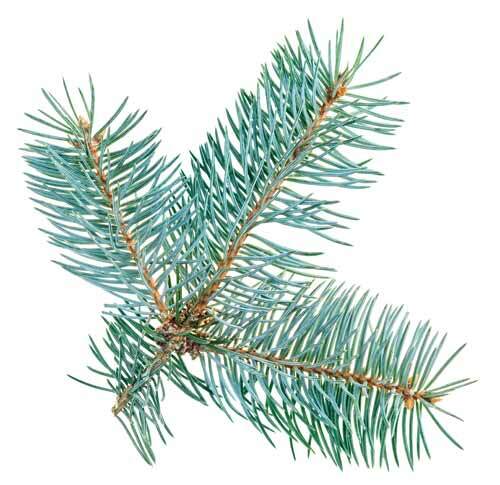 This adaptive native grows 10-26 feet tall around the coastal areas and hilly slopes of this pristine island. Select populations and regrowth areas are harvested to ensure oil consistency and sustainability. 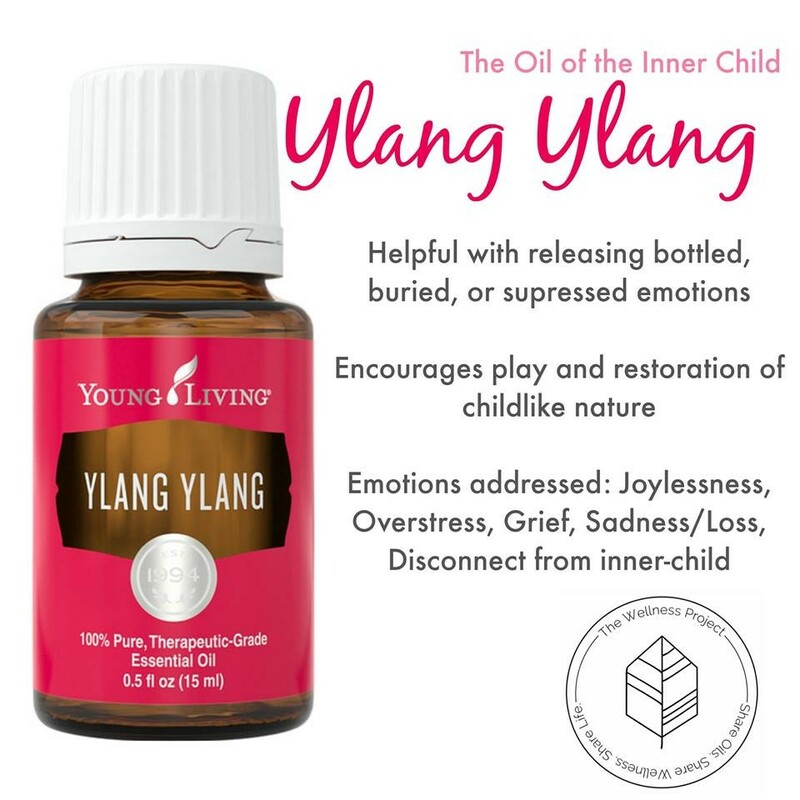 Young Living acquired an exclusive agreement from our Tasmanian supplier to be the only U.S. direct marketing company to offer this oil. Australian Ericifolia has a wide array of health benefits, and we’re excited to include it in YL’s collection of essential oils! Australian Ericifolia is a permanent addition to our oils, and we’re launching it globally today! 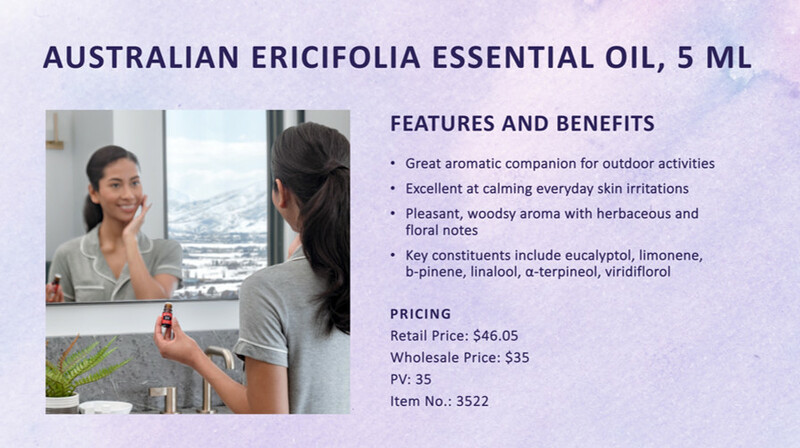 Grab a bottle and bring the wonderful benefits of Australian Ericifolia into your home. 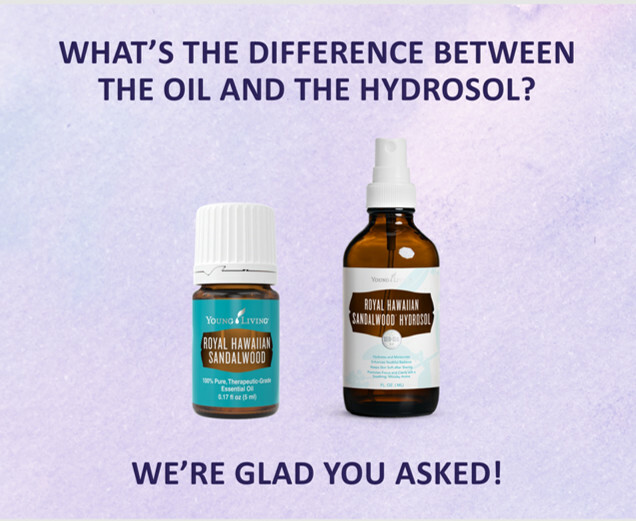 Introducing Royal Hawaiian Sandalwood Hydrosol! Experience Royal Hawaiian Sandalwood like never before! Hydrosol, also known as a distillate or floral water, is an aromatic water produced during the distilling process. It offers many of the same naturally occurring constituents as your favorite essential oil but in a lower concentration. This warm, sweet hydrosol comes from the Kona Sandalwood Reforestation Project in Hawaii, whose practices are dedicated to maintaining the ecological balance of the area. Our new Royal Hawaiian Sandalwood Hydrosol is available in a convenient 3.7-ounce spray bottle, so you can enjoy the benefits of this multipurpose mist anywhere! Share your love of our new Royal Hawaiian Sandalwood™ Hydrosol by spritzing some on your wrists and sporting a YL-branded natural wood sticker on your phone or reusable water bottle. Our aloha sticker is flexible, biodegradable, and dishwasher safe. Apply it anywhere you’d like to show off some aloha spirit! Dab it with a drop of oil or spritz it with some hydrosol and enjoy the warm, woodsy aroma anywhere. Orders will be limited to one item per account per month. 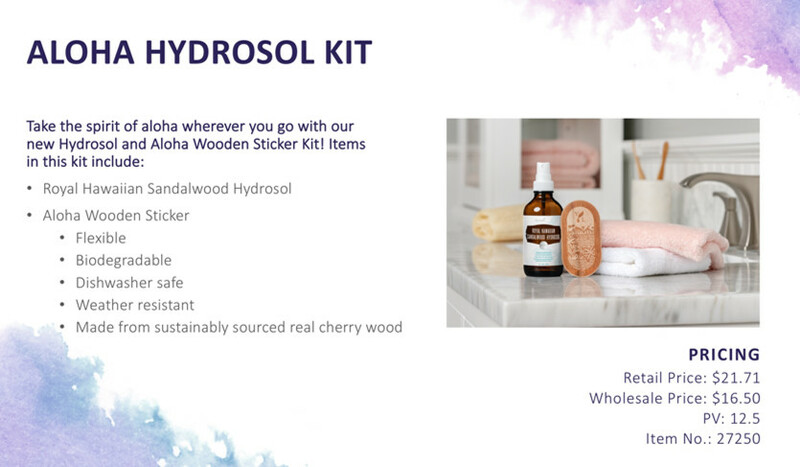 The Royal Hawaiian Sandalwood Kit includes our brand-new hydrosol, a 5 ml bottle of this popular essential oil, and our new YL-branded wooden sticker. 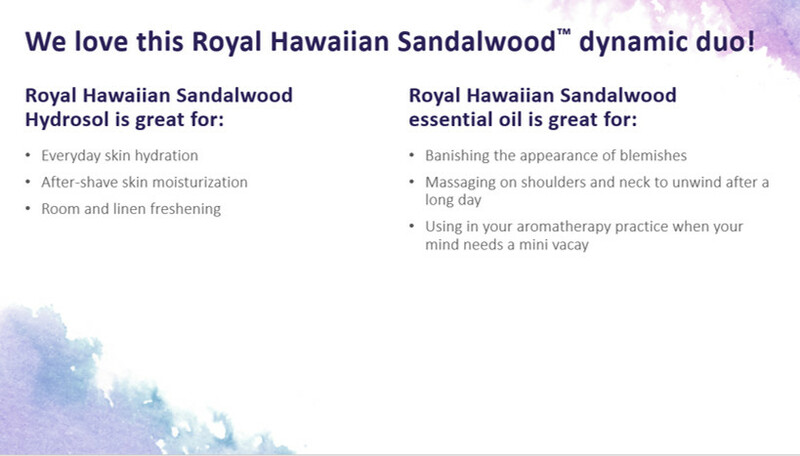 We’re excited to offer Royal Hawaiian Sandalwood in two forms: hydrosol and oil. 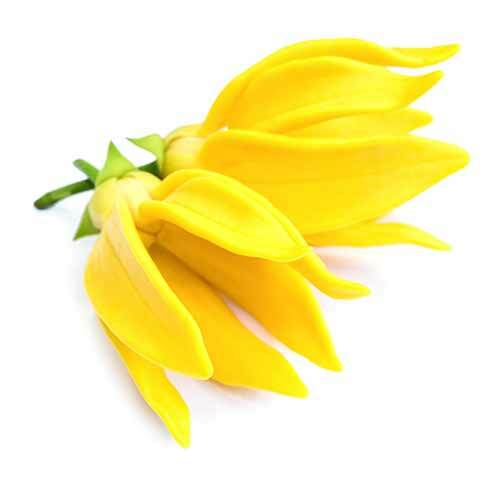 You can keep your skin glowing while bringing the aroma of the Hawaiian islands into your home! We are offering this kit at a 10 percent discounted price—get it while supplies last! Orders will be limited to one item per account per month. 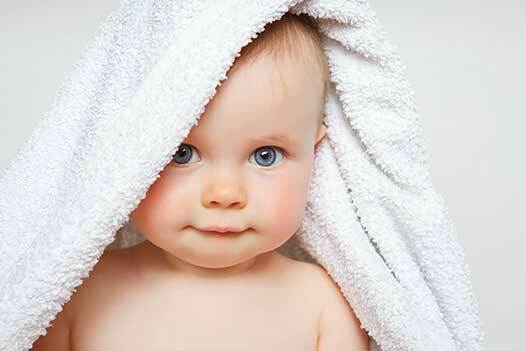 Savvy Minerals® is proud to be a part of the Clean Beauty Movement! We’re adding new products to our clean beauty lineup, and we’re certain you’ll love them as much as we do! What better way to remove our naturally derived makeup products than with naturally derived makeup wipes! 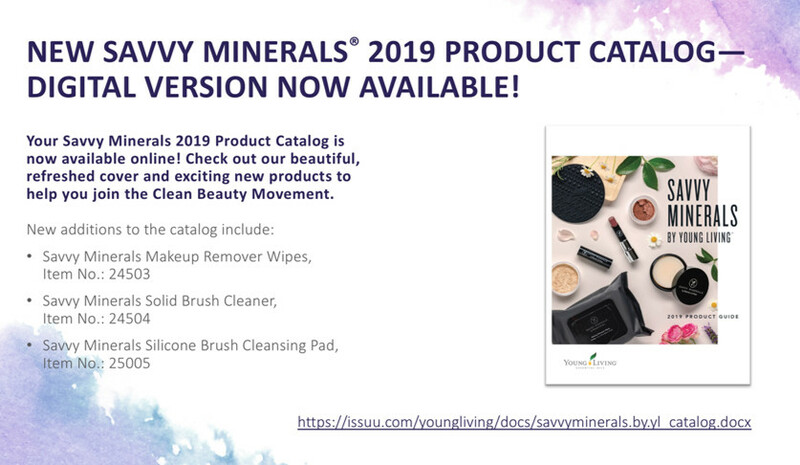 Young Living developed Savvy Minerals Makeup Remover Wipes to gently and effectively remove makeup from and leave your skin feeling soft, clean, and refreshed. These wipes are perfect for traveling or throwing in your purse. Remove your makeup in a couple swipes! 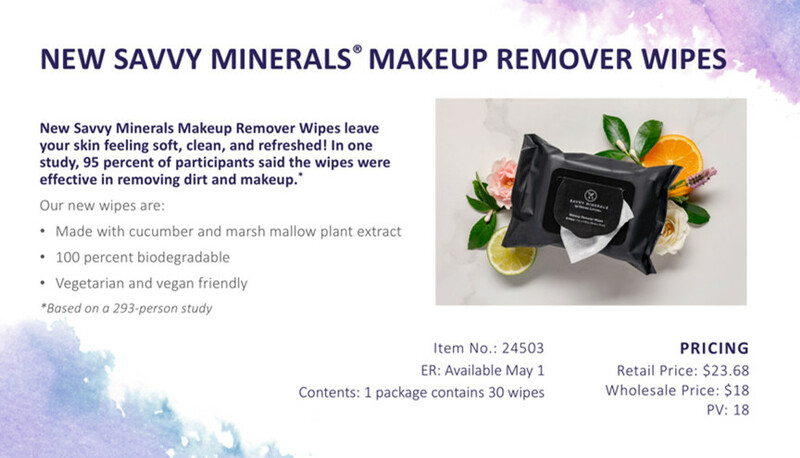 Savvy Minerals Makeup Remover Wipes are available for Quick Order at noon, MT, today and will be available on ER May 1. The Savvy Minerals Solid Brush Cleaner fills your bathroom with the fresh aroma of citrus as it gently cleans your Savvy Minerals brushes. This plant-based soap includes shea butter, jojoba oil, and moringa seed oil to keep your brushes looking brand new! 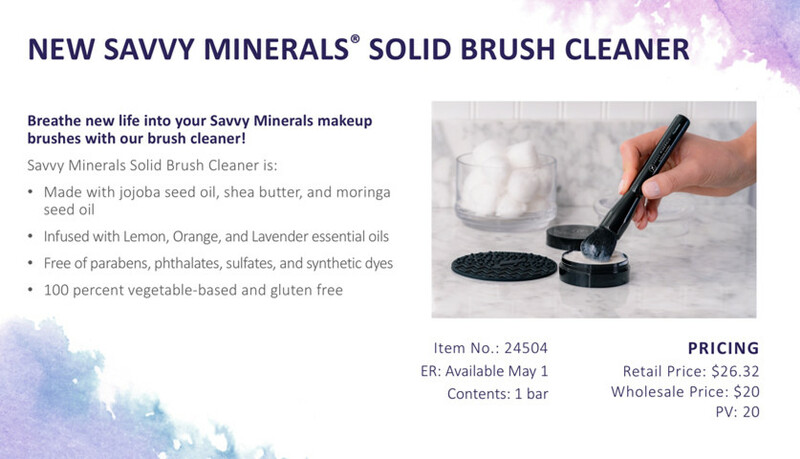 Savvy Minerals Solid Brush Cleaner is available for Quick Order at noon, MT, today and will be available on ER May 1. This is a permanent item that is available for NFR markets. 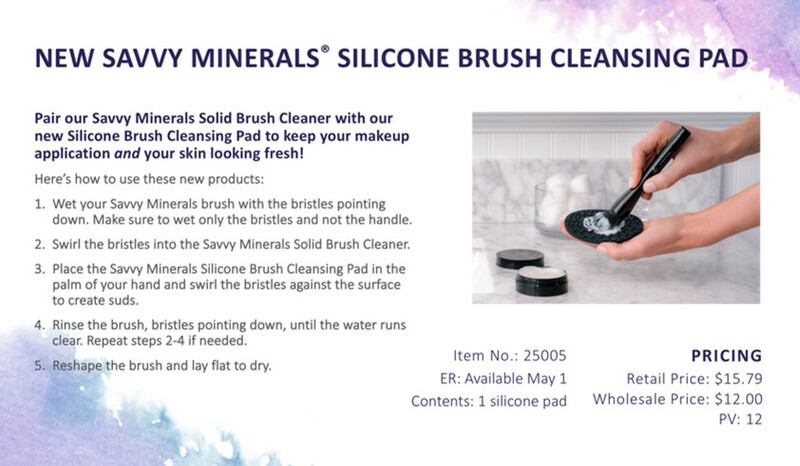 The new Savvy Minerals Silicone Brush Cleansing Pad helps clean makeup, oil, and impurities from your Savvy Minerals brushes. Pair this pad with our Savvy Minerals Solid Brush Cleaner and in a few easy steps, you’ll have brushes free of impurities. Your makeup and your skin will look fresh and fabulous! 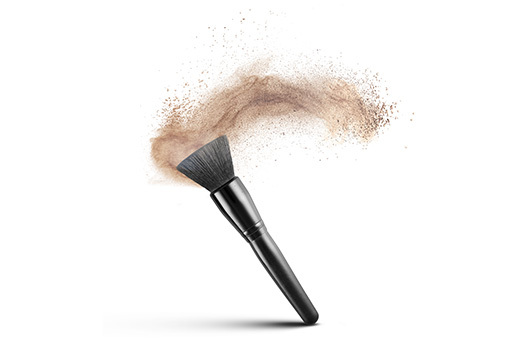 Did you know that our Savvy Minerals brushes are made in Italy using the highest quality craftsmanship? Keep these Italian beauties in top-tip shape with our Solid Brush Cleaner and Silicone Brush Cleansing Pad! The Savvy Minerals Silicone Brush Cleansing Pad will be available on ER May 1. 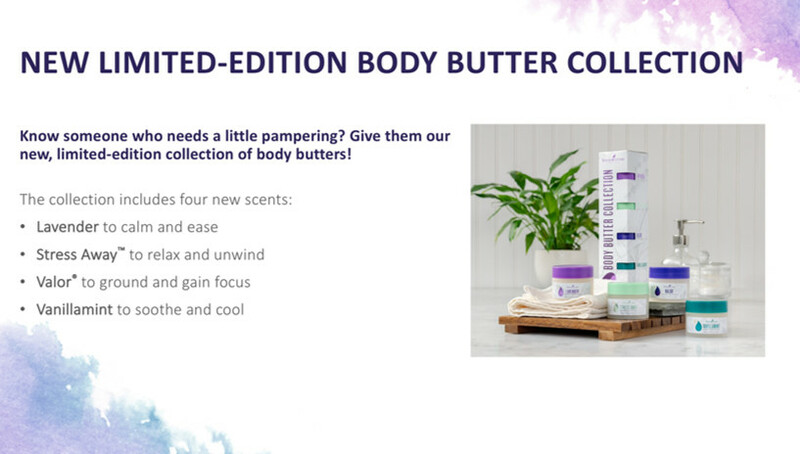 For a limited time, Young Living is offering a special Body Butter Collection with four new scents! Apply Lavender before drifting off to dreamland or Stress Away™ as you decompress for the day. Use a little Valor® to power through an overwhelming project or Vanillamint™ to relieve dry skin while refreshing your outlook. This item is not available for NFR. YL’s Body Butter Collection makes a memorable, thoughtful Mother’s Day gift for your loved ones! Our new collection will be available for Quick Order at noon, MT, today. Hurry and collect your limited-edition collection before it’s gone! 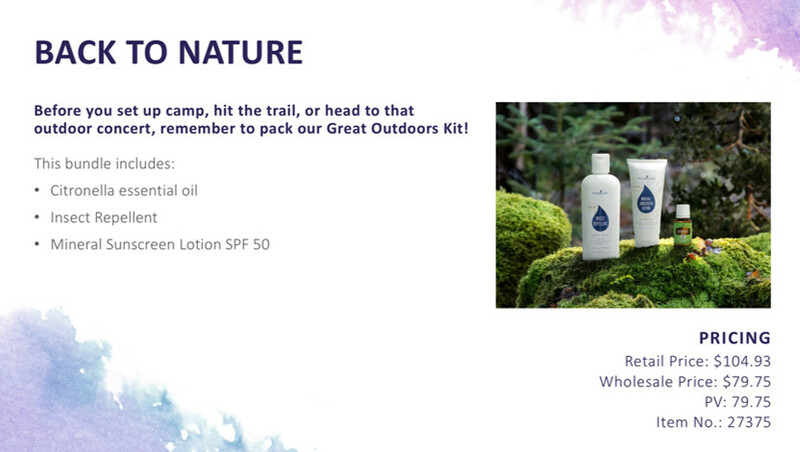 Get back to nature with Young Living’s new Great Outdoors Kit, your go-to for outdoor adventure! Start with our trusted Insect Repellent to help keep bothersome bugs at bay. 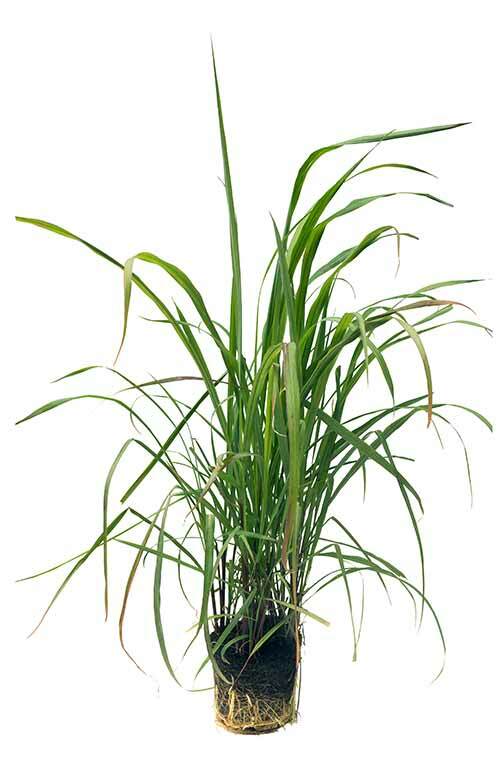 Pair it with Citronella essential oil, a component of and a great complement to our Insect Repellent. Top it off with our all-natural Mineral Sunscreen Lotion, which protects you from damaging UVA and UVB rays without the use of harsh chemicals found in many commercial sunblocks. 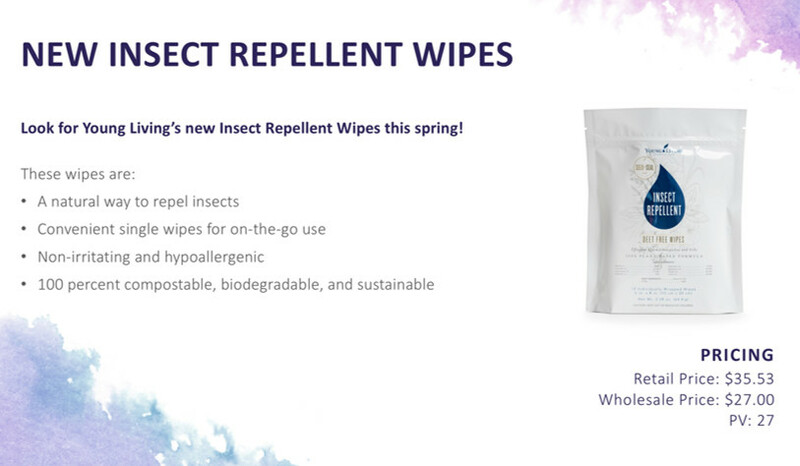 Individually wrapped and easy to apply, Young Living’s new Insect Repellent Wipes offer portable, spill-proof protection you can carry in your bag, purse, backpack, glove box, or back pocket. Look for our new wipes this spring! 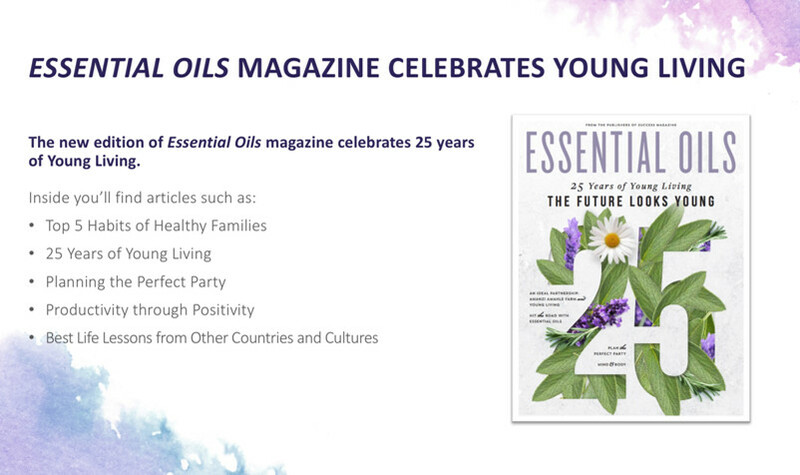 This 25th-anniversary Essential Oils magazine is coming soon to our Premium Starter Kits! 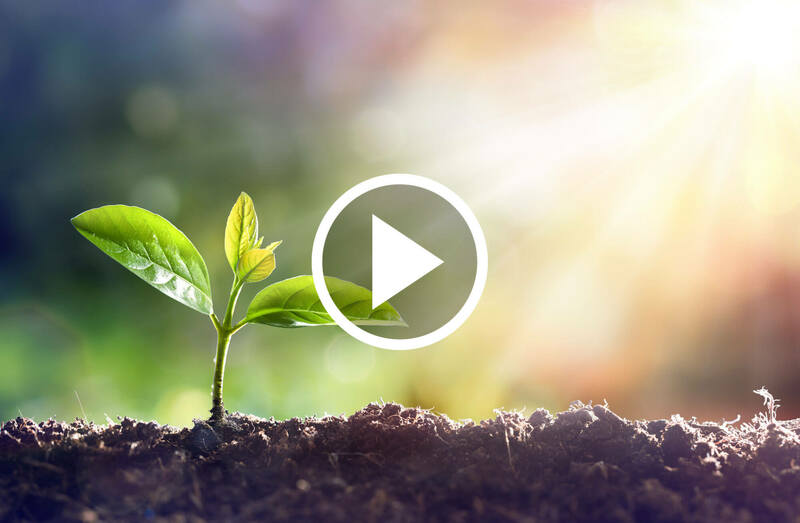 RCD Jodie Meschuk brings it back to the basics as she shares her three pillars on how to keep your business growing. Get ready to celebrate 25 Years Young at the International Grand Convention in July! Starting mid-April, you’ll be able to add these events to your convention registration. Registration for the Foundation 5K and relay is already available—support a great cause by adding that event today. We hope to see you there! Starting today we want to celebrate Young Living’s legacy! For 25 years Young Living has created the highest quality essential oils and spread the joy of living a toxin -free life! 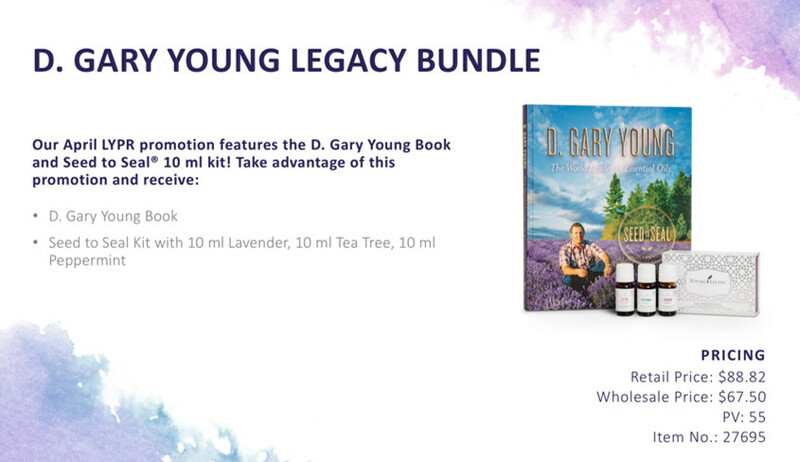 To honor you, Young Living, and our beloved founder D. Gary Young, we’ve created the D. Gary Young Legacy Bundle. Our new bundle is all about the basics—items fundamental to YL. Inside you’ll find a copy of D. Gary Young: The World Leader in Essential Oils and a Seed to Seal® 10 ml kit with Lavender, Tea Tree, and Peppermint. What better way to honor Young Living’s legacy and our Seed to Seal quality commitment! The D. Gary Young Legacy Bundle is available for Quick Order at noon, MT, today until midnight, MT, on Monday, April 8. Bag your bundles before they’re gone! A big part of being a force for good is our stewardship over the earth, and at Young Living, we take that stewardship seriously. To truly make an impact, we must find a way to multiply our efforts. The most powerful way to do so is to share our knowledge, experience, and purpose. We hope you’ll share this final video with everyone you know, on every platform you use, as we continue working toward our 5×5 Pledge goals. I hope you've enjoyed this on-line version of Live Your Passion Rally for April 2019. Are you ready to shake off the cold of winter and embraced spring’s warm embrace? With the mixture of warmth and rain comes growth and opportunity, and Young Living has all kinds of ways to help us with that growth, including this month’s exciting promos! 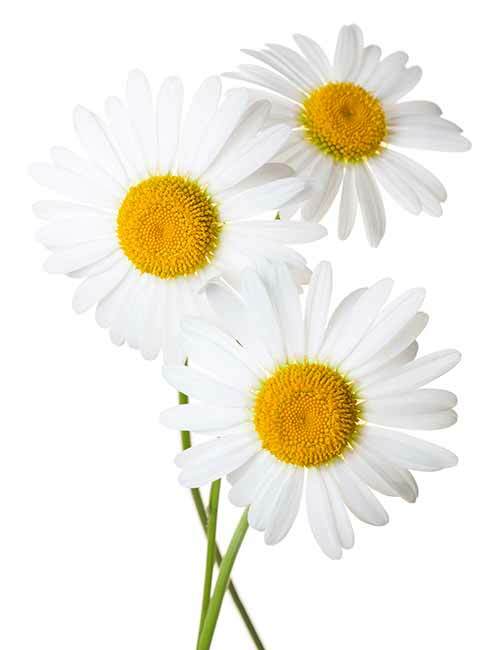 This month features all kinds of ways to help us with grow this Spring. Let’s take a look at those and a few other pieces of news from the world of Young Living. 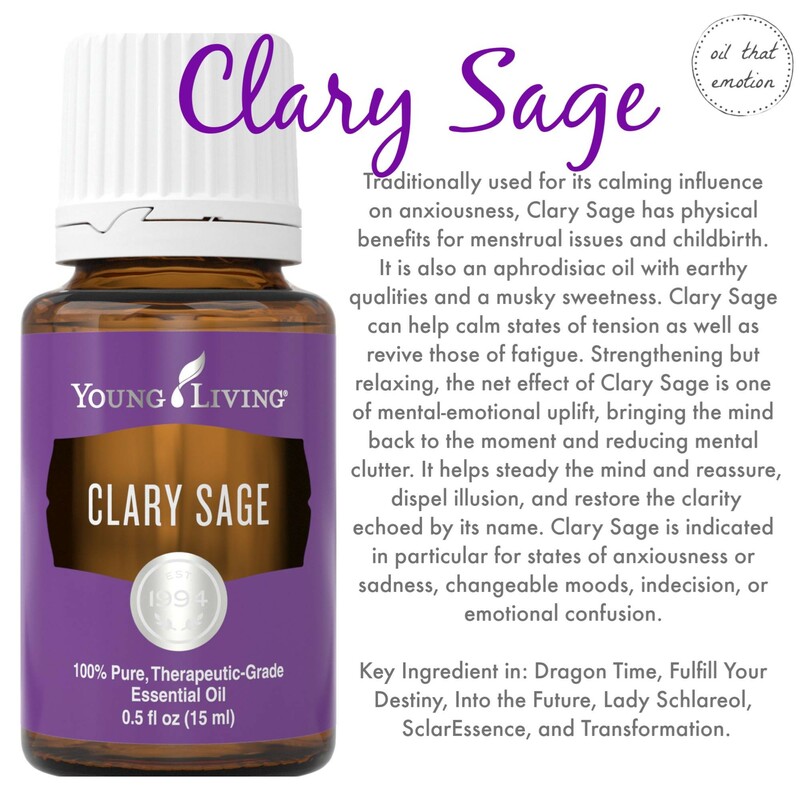 *Remember, in order to get the Essential Rewards Exclusive 10 Bonus Essential Rewards Points and the Essential Rewards Exclusive Clary Sage 5-ml, you have to be enrolled in Essential Rewards (ER) and have an order that meets the PV requirements for those items. The extra bonus of meeting these PV amounts with your ER order is that you get even more ER points to spend later! When you spend 100 PV on your Essential Rewards order, you get 10 bonus ER points to spend on products later, and that's on top of what you're already earning with your order! 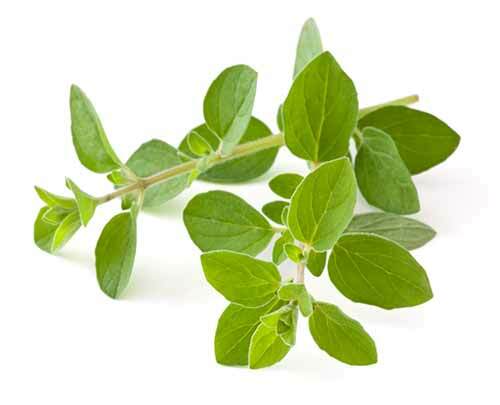 CLARY SAGE has a unique, lightly sweet scent and it is great for helping women feel balanced and grounded (diffuse it with Orange for a little extra calming and uplifting), but you can also add it to your shampoo for healthy looking hair! 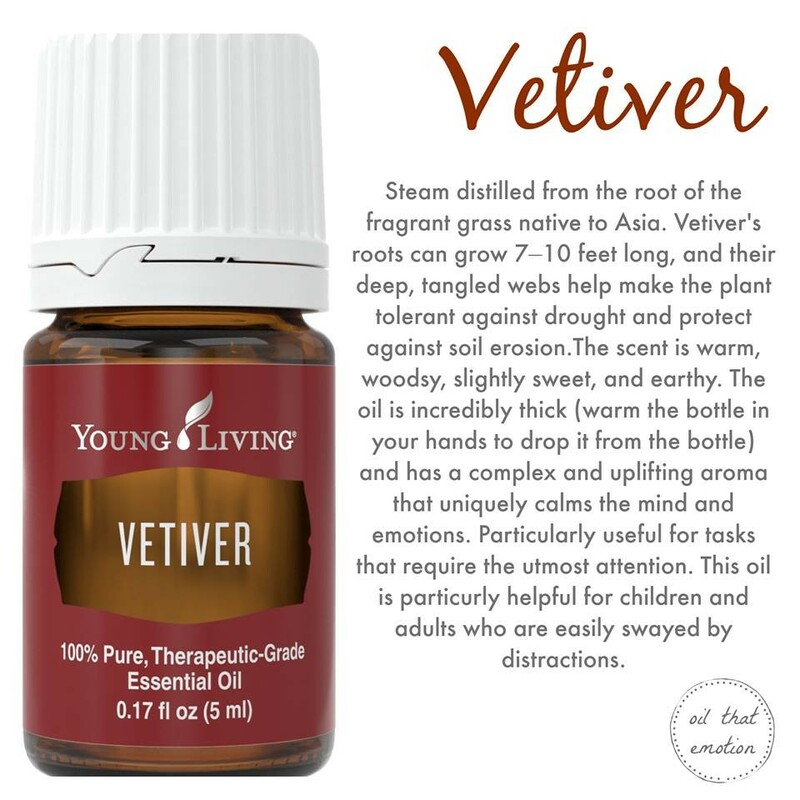 VETIVER is amazing for helping calm the mind and help you focus on the tasks at hand. This will be a great oil to help you get the things on your to-do list done or help the kids focus on their studies for the last few months of school. #protip: combine it with Lavender for a little extra help sleeping. LEMON and TANGERINE will help brighten your days as those April showers. 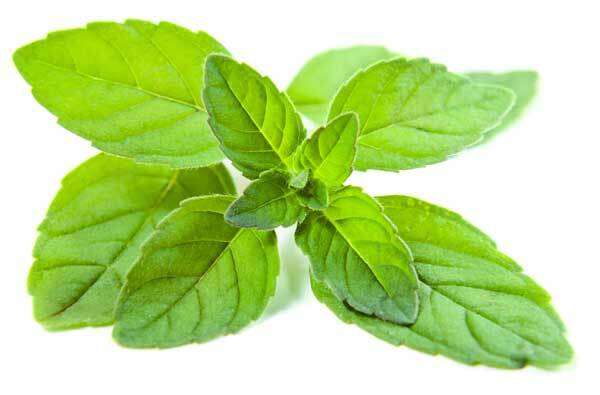 Diffuse them together with some Spearmint or Peppermint in the mornings to start your days off right! Need to unwind at the end of a long day? Take a nice, long bath with the Lavender Calming Bath Bombs and then let sweet dreams carry you away with Dream Catcher in the diffuser. No matter what kind of day you've had, that's a great way to end it. Then there's GOLDENROD. Glorious Goldenrod. Add it to your face wash for a healthy looking, glowing complexion. 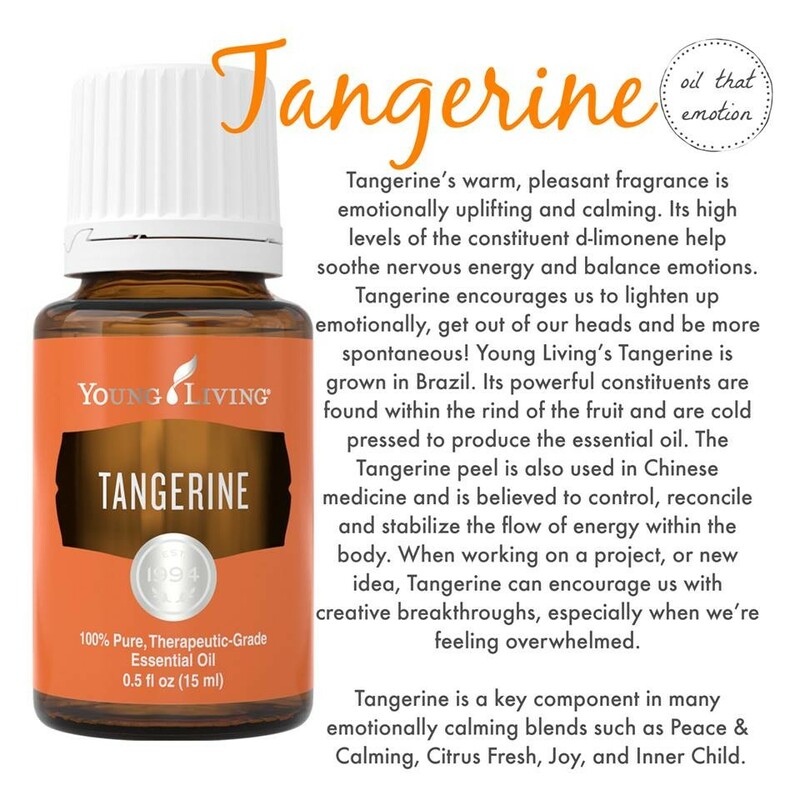 Diffuse it with the Tangerine you get from these promos for a spring-like aroma that will both calm and uplift. 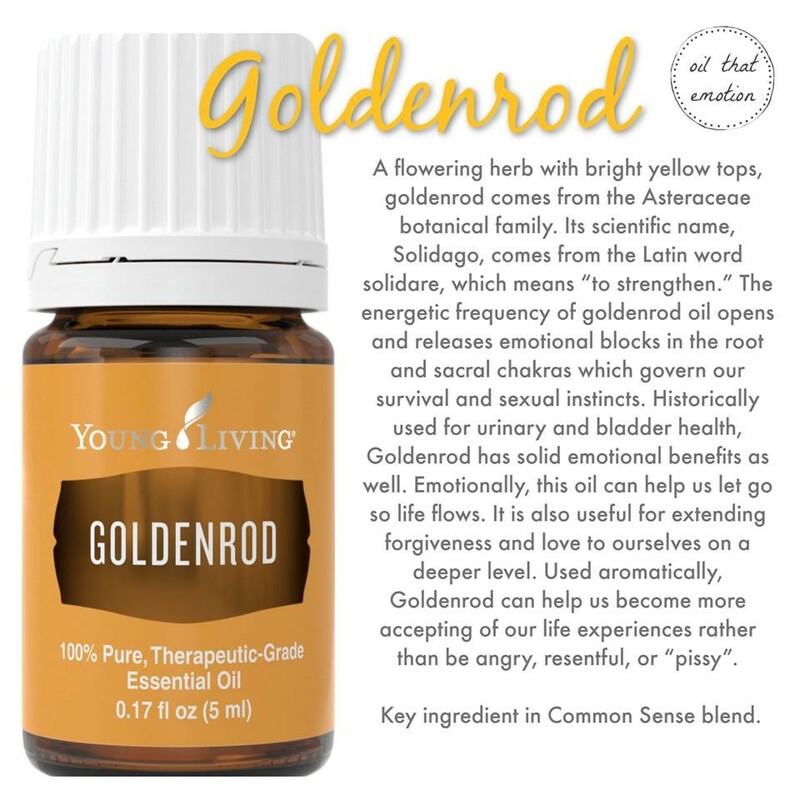 But Goldenrod is also known as one of the "love" oils. There’s a lot of great information out there for how people use this to encourage romance in their relationships. 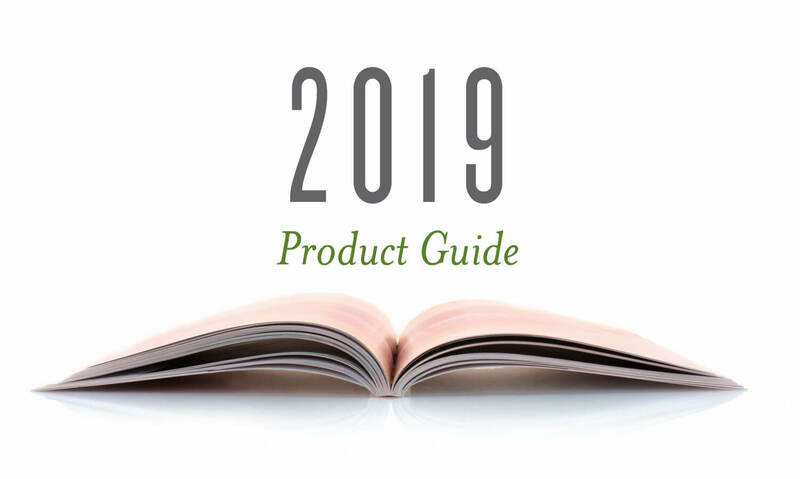 One book that a lot of essential oil users like for learning more about love and romance with essential oils is “Lucy Libido Says…There’s An Oil For That.” Because this is a seasonal oil and not in stock very often, do everything you can to get your hands on a bottle of it this month. You'll be happy you did! 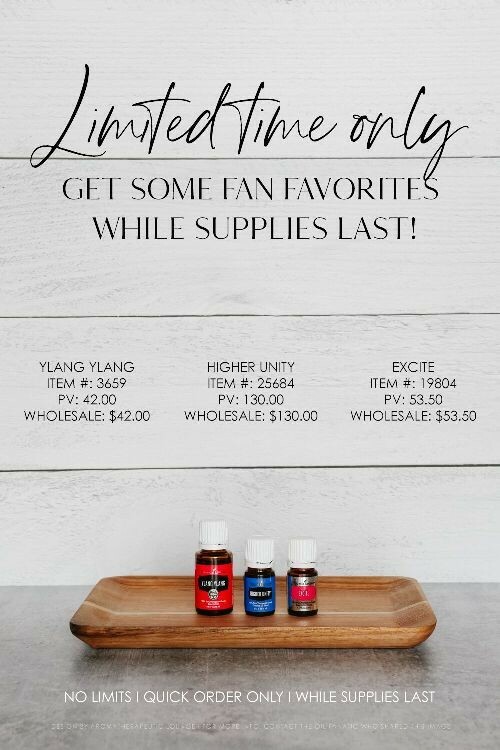 In other exciting news, Young Living had a few more surprises for us last month, including bringing Ylang Ylang back for a limited time, and making Higher Unity and Excite essential oil blends – only available before through the monthly PV promos – available to purchase through Quick Orders for a limited time! Here’s some info on those, and if you don’t know much about Higher Unity or Excite, let me know and we can talk about them! And remember, these are all limited time offers, so it’s while supplies last. Looking for some helpful diffuser recipes? Here are a few that I really like in April. Click here. 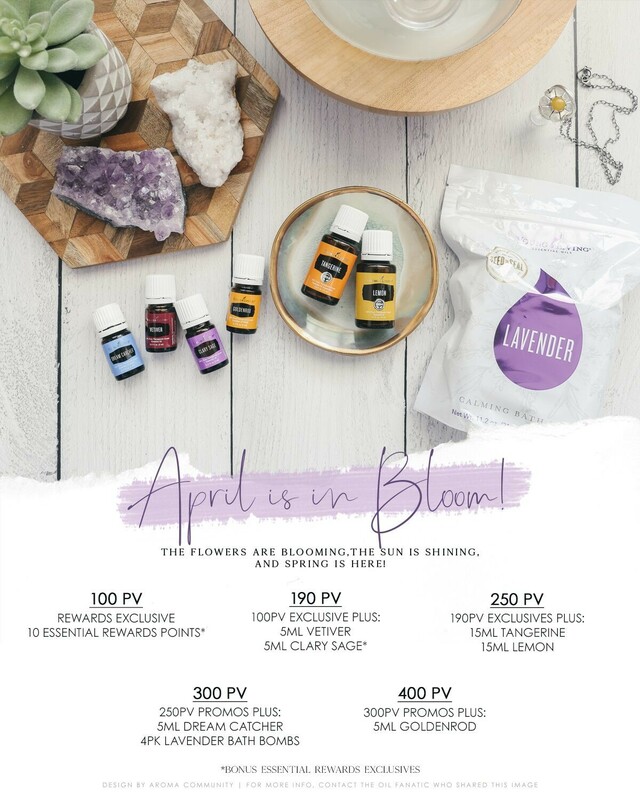 So many wonderful things that April and Young Living have to offer, and I can’t wait to see how this month and the rest of the year turn out! As always, if you need help with anything or have any questions, please let me know as I am happy to help! I hope that you are doing well and that you have an incredible April. Spring Flower, Spring Cleaning. I'm SOOOO READY! Copyrights © 2019 held by respective copyright holders, which include but may not be limited to GetOiling.com and Linda Grupa.